Charles Dana Gibson (September 14, 1867 – December 23, 1944) was an American graphic artist, best known for his creation of the Gibson Girl, an iconic representation of the beautiful and independent American woman at the turn of the 20th century. His wife, Irene Langhorne, and her four beautiful sisters, inspired his images. He published his illustrations in LIFE magazine and other major national publications for more than 30 years, becoming editor in 1918 and later owner of the general interest magazine. Gibson was born in Roxbury, Massachusetts, the son of Josephine Elizabeth (née Lovett) and Charles DeWolf Gibson. He had a sister Josephine Gibson. One of their great-grandfathers was U.S. Senator James DeWolf and a great-great-grandfather was U.S. Senator William Bradford. His sister Josephine inherited Longfield (Bristol, Rhode Island) from their paternal grandmother, Abby DeWolf Gibson. A talented youth with an early interest in art, Gibson was enrolled by his parents in New York City's Art Students League, where he studied for two years. 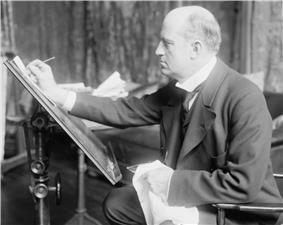 Peddling his pen-and-ink sketches, Gibson sold his first work in 1886 to LIFE magazine, founded by John Ames Mitchell and Andrew Miller. It featured general interest articles, humor, illustrations, and cartoons. His works appeared weekly in the popular national magazine for more than 30 years. He quickly built a wider reputation, with his drawings being featured in all the major New York publications, including Harper's Weekly, Scribners and Collier's. His illustrated books include the 1898 editions of Anthony Hope's The Prisoner of Zenda and its sequel Rupert of Hentzau. His development of the "Gibson Girl" from 1890 and her nationwide fame brought Gibson respect and wealth. His sister Josephine Gibson was said to have been one of his inspirations for his beautiful modern young woman. In 1895, he married Irene Langhorne, born in Danville, Virginia. One of her four sisters was Lady Nancy Astor, the first woman to serve as a Member of Parliament in the British House of Commons. His wife and her elegant Langhorne sisters also inspired his famous Gibson Girls, who became iconic images in early 20th-century society. Their dynamic and resourceful father Chiswell Langhorne had his wealth severely reduced by the Civil War, but by the late 19th century, he had rebuilt his fortune on tobacco auctioneering and the railroad industry. After the death of John Ames Mitchell in 1918, Gibson became editor of LIFE and later took over as owner of the magazine. As the popularity of the Gibson Girl faded after World War I, Gibson took to working in oils for his own pleasure. In 1918, he was elected into the National Academy of Design as an Associate member, and became a full Academician in 1932. Almost unrestricted merchandising saw his distinctive sketches appear in many forms. The Gibson cocktail has been claimed to be named after him, as it is said he favored ordering gin martinis with a pickled onion garnish in place of the traditional olive or lemon zest. For part of his career, Gibson lived in New Rochelle, New York, a popular art colony among actors, writers and artists of the period. The community was most well known for its unprecedented number of prominent American illustrators. Gibson owned an island off Islesboro, Maine which came to be known as 700 Acre Island; he and his wife spent an increasing amount of time here through the years. He retired in 1936, the same year Scribner's published his biography, Portrait of an Era as Drawn by C.D. Gibson: A Biography by Fairfax Downey. On his death in 1944, Charles Dana Gibson was interred at Mount Auburn Cemetery in Cambridge, Massachusetts. Bulloch, J. M (1896). "Charles Dana Gibson". Davis, Charles Belmont (January 1899). "Mr. Charles Dana Gibson and his Art". The Critic. XXXIV (859): 48–55. Retrieved 2009-07-27. Gelman, Woody (ed.) (1969). The Best of Charles Dana Gibson. New York: Bounty Books. Marden, Orison Swett (1905). 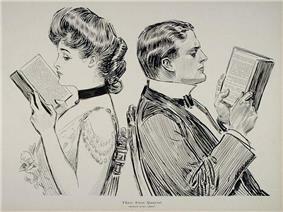 Little Visits With Great Americans, Chapter XXXIII "Charles Dana Gibson, Originator of the "Gibson Girl". New York: The Success Company. pp. 342–352. Retrieved 2009-07-27. The Gibson Girl and Her America. The Best Drawings of Charles Dana Gibson selected by Edmund Vincent Gillon, Jr. Dover Publications, Inc., New York, 1969. *— (1905). Sketches in Egypt. New York: Doubleday & McClure Co. Retrieved 2009-07-27. ^ Rossiter Johnson, John Howard Brown (1904). The twentieth century biographical dictionary of notable Americans. The Biographical Society.